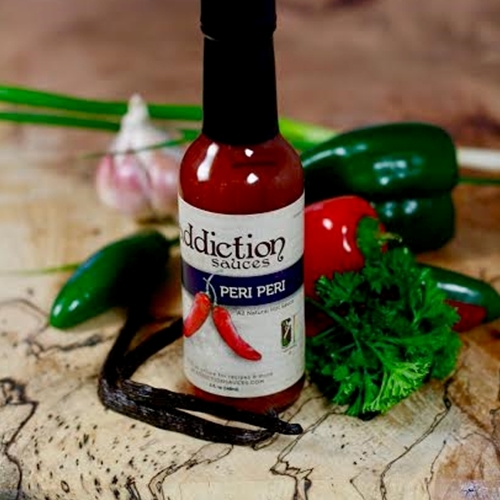 Addiction Sauces' Peri Peri Hot Sauce adds a splash of true Louisiana home-cooked flavor and subtle spice to seafood, wings, burgers, chili and much more. Made with a special blend of herbs and spices, Peri Peri mild Louisiana-style hot sauce gives your cooking a Deep South signature. As one of the most popular of Addiction Sauces' recipes, Peri Peri hot sauce provides mild heat that mixes perfectly into nearly any plate and appeals to all palates. Peri Peri hot sauce is the ideal place to start your love of spicy, Louisiana cuisine. Order a 5 oz bottle to give it a try or a case to satisfy your taste buds for months to come.